The end of 2018 is almost here. But there is much still to do around The Fountain at the Circle and Fountain Walk. Repairs scheduled: In the next few weeks, much-needed repair work will get underway on the historic balustrade that borders The Circle. 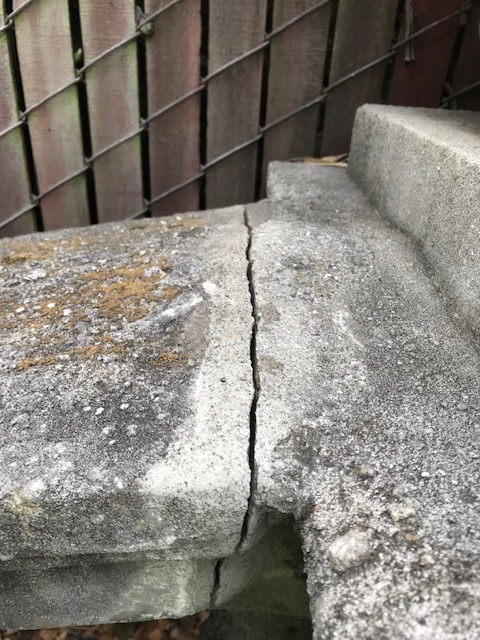 Several large cracks have developed over the years that need to be fixed. 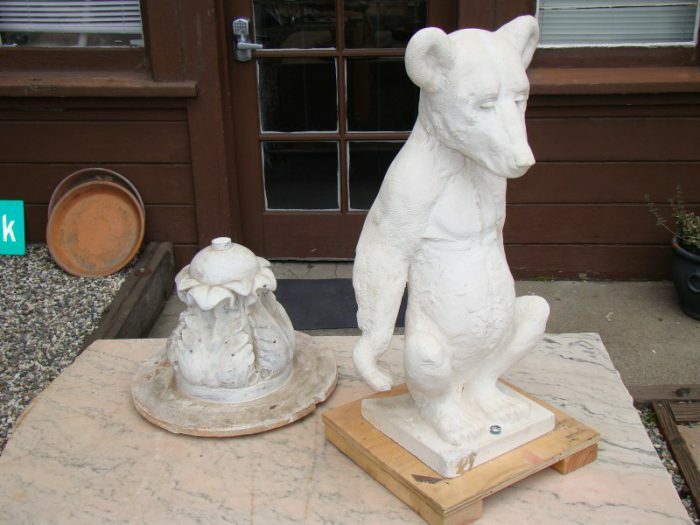 A top-notch Bay Area masonry company, Hans Thiering Masonry (whose firm did a major restoration of dozens of damaged balusters a few years ago), is scheduled to begin the job soon. The work should help prevent further serious deterioration by filling cracks where water can get in (we assume it will rain again sometime). Hans will also repair a small crack that has developed on the coping of the fountain’s main pool. We hope the work will be done fairly quickly and not be too disruptive. 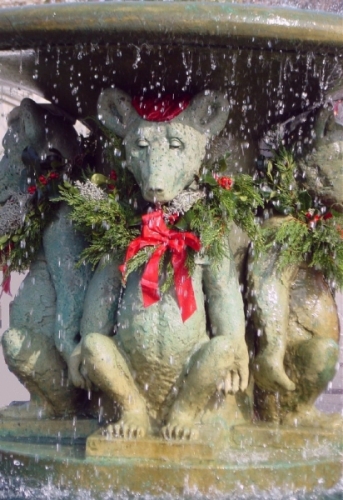 Holiday decorating: In what has become a well-loved tradition, FOFW volunteers will soon be decorating the fountain and island in The Circle for the holiday season. That work will take place either the last weekend of November or the first weekend in December, weather permitting. The decor is kept simple and non-denominational: lighted green swags around the perimeter, wreaths and bows ornamenting the four grizzly bear cubs. (In a nod to Hanukkah, however, the cubs also are outfitted with kippahs.) We hope the community enjoys the display. And in tidings of less joy: In light of the huge fires raging in our state and the sad destruction they have wrought, this news is indeed a minor concern. But it had been several months since the fountain had been vandalized by someone throwing dish soap or detergent into the pool. Until this week, that is. On Monday morning, we found the fountain full of soap suds. To the perpetrator and perhaps others, this may seem like harmless fun. It is not. Especially during another period of drought, having to drain and refill the fountain wastes a great deal of water. The soap also can gum up the pumps and filters that run the fountain. And our volunteer maintenance crew has to take hours to deal with it. So please, spread the word that soaping the fountain is a bad, thoughtless and wasteful act, no matter how much “fun” it seems. Twenty-five years of FOFW: This week, your neighborhood nonprofit marks the 25th anniversary of its founding. 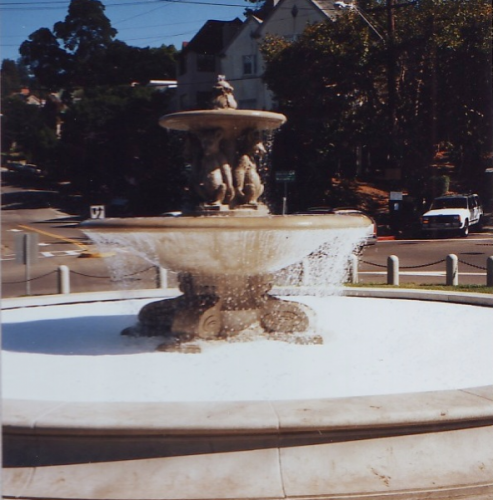 It began when two groups of neighbors brought together by then-Mayor Shirley Dean began organizing and raising funds to commission and install a reproduction of the long-lost Fountain at The Circle and restore the adjoining pathway, Fountain Walk. A quarter-century later, all-volunteer FOFW continues to be dedicated to its mission of helping preserve and maintain these city landmarks. And that work would not be possible without the support of numerous volunteers and donors. You can find out about volunteer opportunities and how to donate (to support such efforts as the balustrade repairs) by clicking on the “Volunteer” and “Donate” buttons at the top of the page. Happy anniversary to FOFW and to you, an early “Happy Holidays!” and thanks, as always, for your support. Thank you so much for your continued hard work keeping the Fountain and The Circle in good condition. It is such a joy to show if off to visitors. My heart sank when I saw those soap suds on Monday. Your hard work is much appreciated. Thanks, Anne. We appreciate your comment. Hi, Donald. Because this sort of vandalism is more of a nuisance crime, even catching a perpetrator on video might not lead to much, unfortunately. Instead, we have for several months now regulated the operation of the fountain so that the lights and operating system are off during the early morning hours when soaping tends to happen. It has been quite successful. Unfortunately not foolproof, however. Thanks for your comment and concern. If you did have cameras and you could get the perpetrator identified, would the police at least get them to clean out the fountain? Hi, Sue. An interesting — and perhaps appropriate — consequence, but not sure the wheels of justice would turn in exactly that manner. As I said, we think prevention efforts have proven to be the best course. Besides, security cameras in such a public space would be an intrusion on the privacy of people not despoiling the fountain, too, which is something we think we should avoid. Thanks for your thoughts.